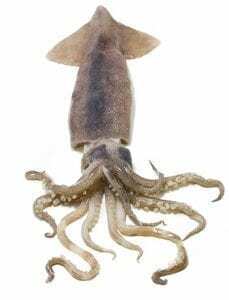 The squid is the more commonly known and appreciated relative of the octopus and cuttlefish. Squid have a firm yet tender texture that is easily recognized, providing a well loved and delicious calamari staple for your menu. Caught locally and sustainably, your fresh squid is waiting at Pucci Foods. The firm, flavorful meat of squid can be used in endless exquisite recipes. When grilled or fried, dipped in a sweet or tangy sauce or tossed with lemon and olive oil, calamari plays a dance on the seafood lover’s palate. The deliciously tender texture provides an exciting canvas for the cook to create a masterpiece delicacy. We are certain your diners will find our fresh calamari to be undeniably mouthwatering. Squid are very resistant to overfishing as they grow and reproduce quickly. They are caught with purse seines, which cause very little damage to the environment when special care is taken. Squid play an important role in healthy marine ecosystems by providing food for fish, sharks and marine mammals. It is important that we support sustainable squid fisheries that work to prevent overfishing. California has a unique fishery that actually supplies the majority of market squid on the global market. Fishermen deploy lights from their boats that shine from various angles directly above squid spawning grounds. These lights attract the squid to the surface, where the boats can easily net them. These spawning squid are target because they die shortly after reproducing and the entire population resets itself every year. It’s an excellent fishery management technique that ensures the population will remain healthy and abundant year after year. Pucci Foods has only the highest quality squid available for your calamari cooking pleasure. Enjoy succulent squid from our market today and know that your seafood comes from a business that truly cares about their clients. Order your fresh squid today by filling out the form on this page and a member of our team will contact you soon.